Shaded by the towering pines, grab your front row seating on the ICW to watch some of the most interesting sights on the Gulf. 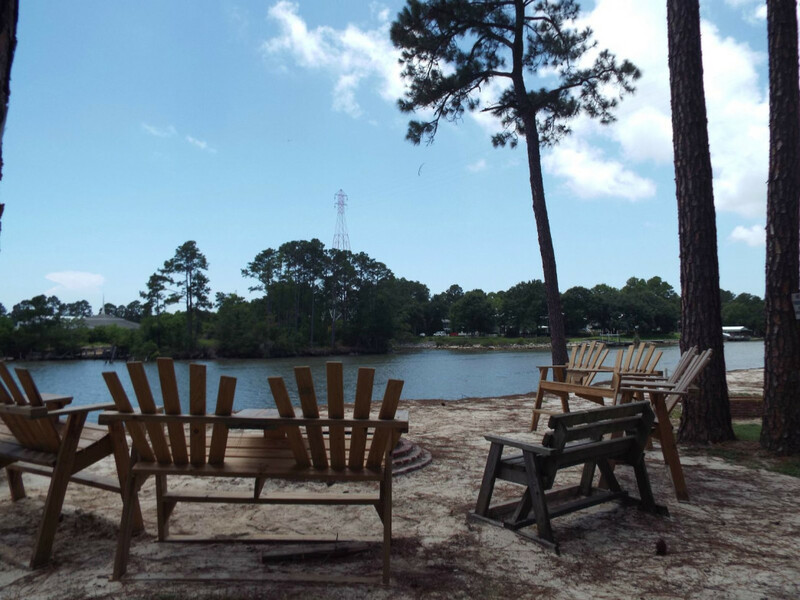 Camping at Southport is not exactly camping under the stars, but the views of the Intracoastal Waterway and proximity to the beaches add an element of adventure to your stay. 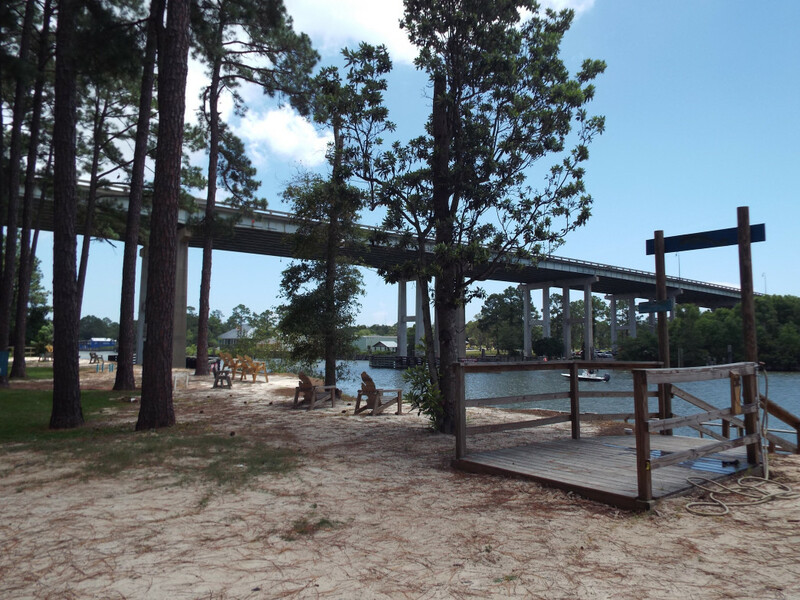 Not what you would consider camping under the stars, Southport Campgrounds is tucked underneath the Intracoastal Waterway Bridge that connects the mainland of Gulf Shores and what is considered Pleasure Island. Within walking distance of Lucy Buffett's LuLu’s Restaurant and Homeport Marina, food and entertainment will never be a problem. Enjoy spectacular views of the many vessels traveling along the Intracoastal Waterway. A pier and kayak launch allows entry into the water or a place for fishing. A bathhouse, restrooms, a clubroom with kitchen access, and coin operated laundry facilities are available onsite. This campground is more suited for RV camping but does have tent sites. It is conveniently located off Highway 59 South, close to shopping and grocery stores. Tent campsites are not marked and are directly underneath the Intracoastal Waterway Bridge. There are no playgrounds or swimming pools. During festivals, the campgrounds can become crowded. Pirates Island Adventure Golf and The Track Family Recreation Center are less than a mile away and several public beach access points are only three miles from the campgrounds. Everything you need to make your stay more comfortable is within a five to ten minute drive. The campgrounds can be a noisy with the Intracoastal Waterway and bridge traffic but it is shaded and sandy giving it a rustic beach feel. A greenspace on the water’s edge has several picnic tables and sitting areas for groups, adding a nice touch. Those who primitive camping, may find is noisy and cramped but convenient. RV campers will get the most from this campgrounds which is extremely popular among many that have visited in the past. Traveling on Highway 59 South/gulf Shores Parkway, turn right at red light before the Intracoastal Waterway Bridge onto East 29th Ave. for 0.2 miles. Continue straight onto County Road 4 for 341 feet, keep right and continue onto Waterway W. Blvd. for 308 feet. Turn right onto West 25th Ave. Campgrounds will be on the left.